Well, Sean’s first impressions that is. My good friend and bicycle buddy Sean Lee-Siebels arrived yesterday morning in Amsterdam. I met Sean almost ten years ago in a dorm room at Whitman College; he was freshman year roommates with my high school boyfriend who I was visiting for the weekend. A lot has happened since Sean and I first met in that dorm room. We finished college, relationships started and ended, we had loved ones die, we made new friends, we traveled the world, we started our careers, we became independent. Sean and I reconnected shortly after college when we both moved to Seattle and started playing on the same indoor soccer team, Medium Rare. Medium Rare quickly became a core part of my Seattle social life; my Medium Rare teammates were my go-to group for Friday happy hours and weekend trips. Nearly everyone on the team had a shared love for numerous other sports and outdoor recreation. Together, we’ve hiked and skied in the Cascades, surfed on the Olympic Peninsula, floated down the Twisp River, sailed to Blake Island, and biked along the Yakima River. My friend Derek (far left) is wearing his favorite pants in this picture. The pants were formerly owned by my Mom. Sorry Mom. Sean is an avid city biker. He doesn’t own a car and he bikes almost everywhere he goes in Seattle. I always admired Sean for being a bike commuter but didn’t think it was for me. 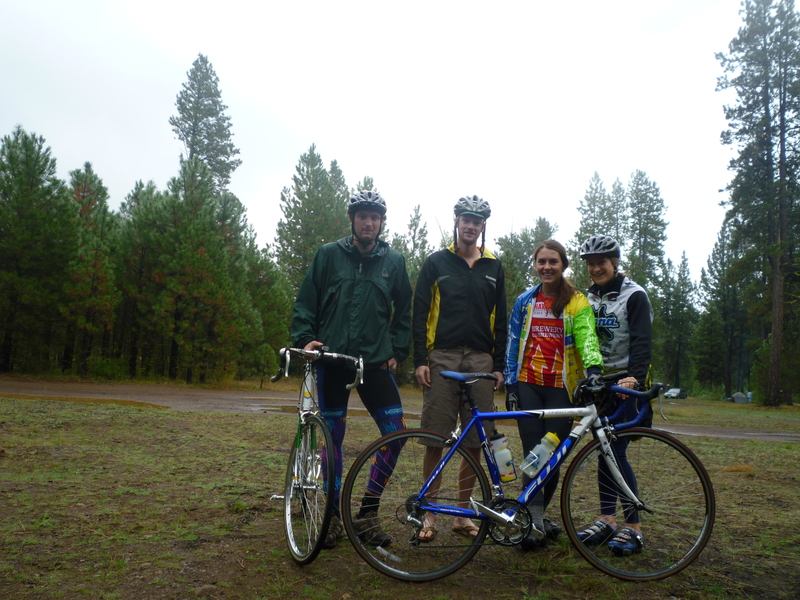 A little over a year ago I was working on a project for the Cascade Bicycle Club and began thinking about cycling a lot more as I was doing research and work on the project. I told Sean that I was interested in bike commuting but that I was a little intimidated by biking downtown. He reassured me that I would be fine and—like a lot of people who bike commute—he shared with me that his rides around the city were one of the most enjoyable parts of his day. Finally one summer morning I decided to bike into work. Several of us were meeting to play tennis after work at the Greenlake tennis courts and I realized that to get from my Madrona apartment to work to Greenlake and then back to Madrona would either require multiple hours on a bus, driving into work, or biking. I decided to bike. I left my apartment early to avoid rush hour and took advantage of the calm morning streets. I went down streets I didn’t usually go on, noticed new buildings on Capitol Hill that I’d never stopped to look at, and felt refreshed when I got to work. Sean met me after work that day at my office on 1st and spring and gave me a few tips about biking in downtown rush hour traffic. I followed his lead as he slipped by waiting cars at traffic lights to get to the front of the intersection and was amazed by how quickly we made it to Lower Woodlands for our tennis game. The tennis game didn’t go so well for me, but I was hooked on bike commuting after that day and I partially have Sean to thank for giving me the extra push I needed. Sean brought his bike from the US and reassembled it at the airport yesterday morning before biking into the city to meet me. 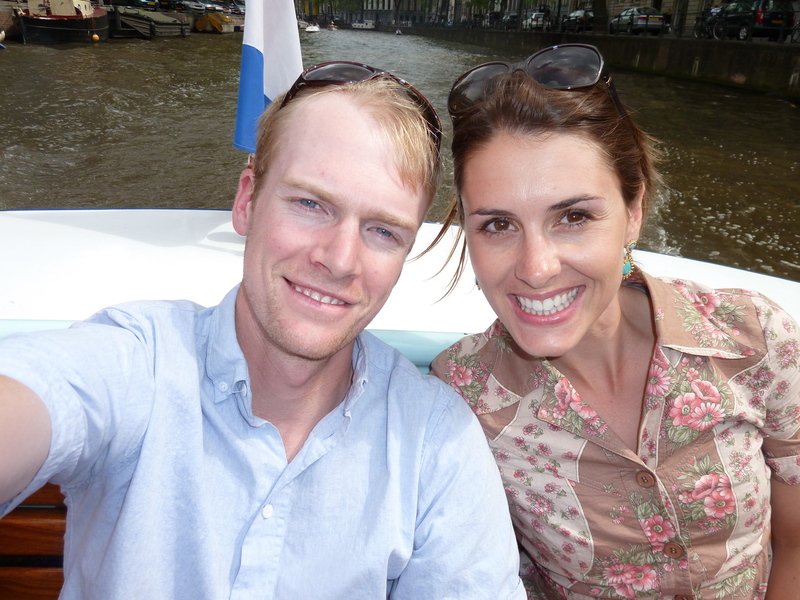 We spent most of yesterday biking around getting lost, drinking beers, people watching, and even splurged and did a touristy canal tour. Sean and I are both impressed by how skilled bikers in Amsterdam are. Yesterday was a gorgeous, sunny day and all of Amsterdam seemed to be in parks, eating and drinking at outdoor cafes, and taking boat rides in the canals. We saw a man riding a rickety bike one-handed while eating a double-scoop ice cream cone. His girlfriend was riding side-saddle on the back and also eating an ice cream cone. What impressed us was that this man and his girlfriend seemed utterly relaxed and very focused on their bright fuchsia, berry-flavored ice cream while they were maneuvering through a busy intersection full of pedestrians, tourists, other bikers, and a few cars. When I was speaking with Kristen van den Hul a few days ago, founder of the Change Agent, she told me that she learned how to bike before she learned how to walk. Cycling situations that might be stressful to a new cyclist are routine and uneventful to most Dutch cyclists. When I met with Kristen she had actually just come from purchasing her first car ever. She bought a vintage sports car and was taking it out to her mother’s house in the country later that day because she had no where to park it. There are five-year waiting lists for parking permits in Amsterdam and street parking is between 5 and 4 Euros per hour in the city depending on where you are. Gas also costs about $10 USD per gallon in Holland right now. Kristen was looking into renting a private parking spot in Amsterdam and said she would probably pay between 175 and 300 Euros per month for parking. Car purchases in Holland are also subject to several expensive taxes. Owning a car is a luxury in Amsterdam. There’s actually a limited supply of bike parking in certain parts of the city too—but it is almost always free unless you park in a guarded lot. 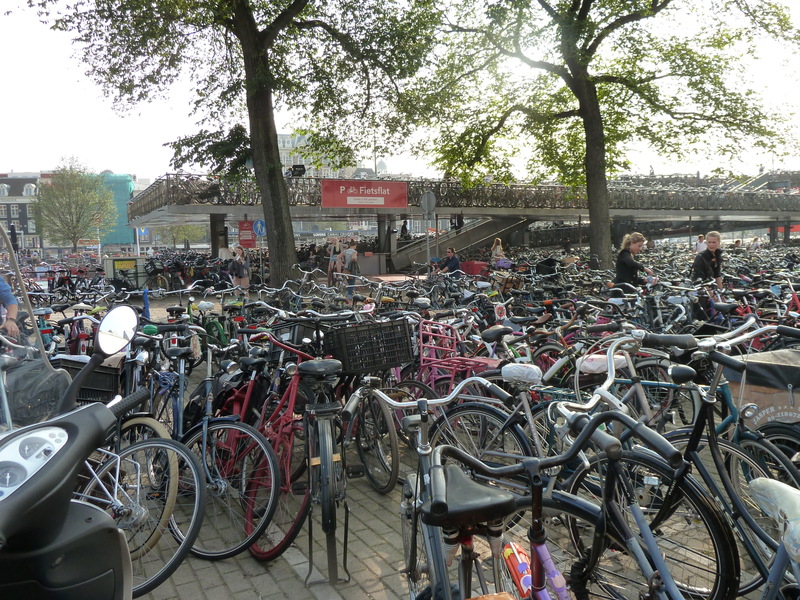 The Central Station bike parking facility--called the "Bike Boat"--can hold over 7,000 bikes. Sean and I leave Amsterdam tomorrow and will begin heading south to Brussels and then on to Paris to catch the last stage of the Tour on July 24th. We’re going out tonight in the Red Light District to top off our Amsterdam experience and hopefully won’t get a terribly late start tomorrow morning. We’ve been working on our route today and have also been looking for team jerseys to wear while we ride. Stay tuned for more updates from the road, shots of the team jersey, and perhaps a guest blog post from Sean. Have a great ride to Paris! It will be interesting to hear if drivers there think Sean is a jackass on the road when he bikes. Apparently when his earphones broke here, he noticed that a lot more people were cursing at his biking than he ever realized. Is it the US drivers or Sean’s biking? keep us updated. He’s already been yelled at by a police officer once. For the record, he wasn’t yelling, just speaking sternly (mostly in Dutch). 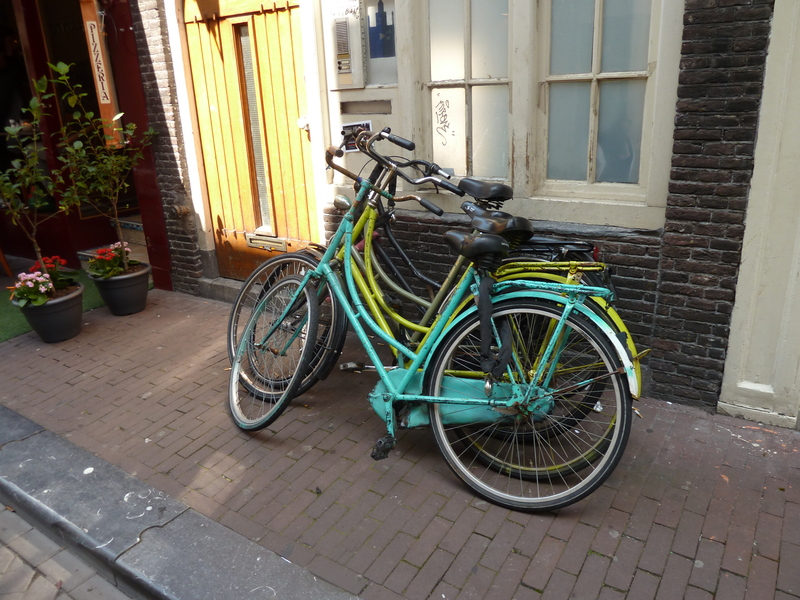 Moreover, two days riding in Amsterdam prompted just one civilian encounter, and I’m pretty sure I more or less had the right of way, more or less, in that one. Those are my favorite pants too and I can’t believe Derek has them! How did he get them and does he know they’re actually girls’ ballet tights? At least we have settled that it is his biking at the very least. Your in Europe now Sean. Show down, enjoy the scenery. You dont want to piss off the other bikers also. Oh, he knows, Therese. I’m guessing he just likes the way they make his legs look. love how team tim made the blog! yeeeehaaaaaaaaaaaw!! sean – don’t come back with road rash pleeeeease. miss you guys!